The spectator selects a card from the performer’s deck and does not reveal it to the performer until requested to do so. The performer then shows a packet of four Jokers to the spectator, displaying the faces and backs of all four cards. He then asks the spectator to wave his selected card over the Jokers he is holding in his hand. When the performer turns the packet face up and displays the cards, they are no longer Jokers! Instead, all four cards are now identical to the spectator’s selected card! But that’s not all! 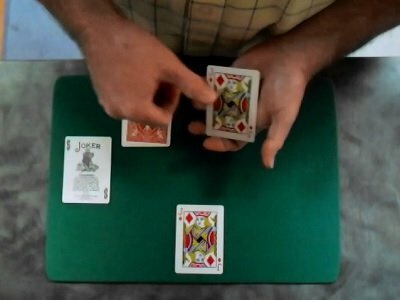 When the performer squares the four cards back together, he asks the spectator to wave a Joker which had been previously set aside over the cards in his hand. When the spectator does this, the performer then displays the four cards, revealing that they are all once again Jokers! This amazing effect requires no gimmicks. The entire routine is done by sleight of hand using ordinary playing cards. Each card control utilized is thoroughly taught in a clearly presented 22 minute tutorial video.